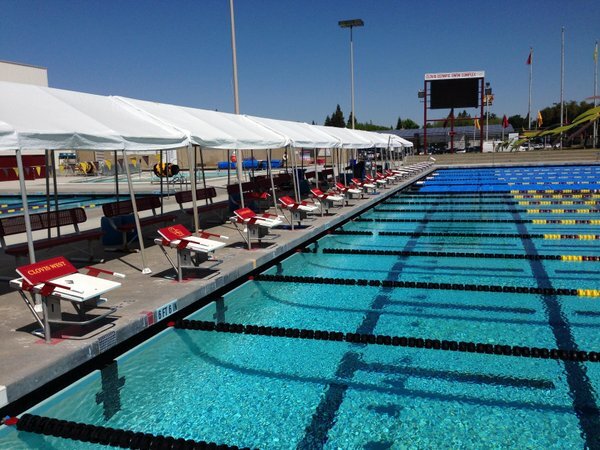 The first CIF State Swimming and Diving championships was held last year at Clovis West high school. 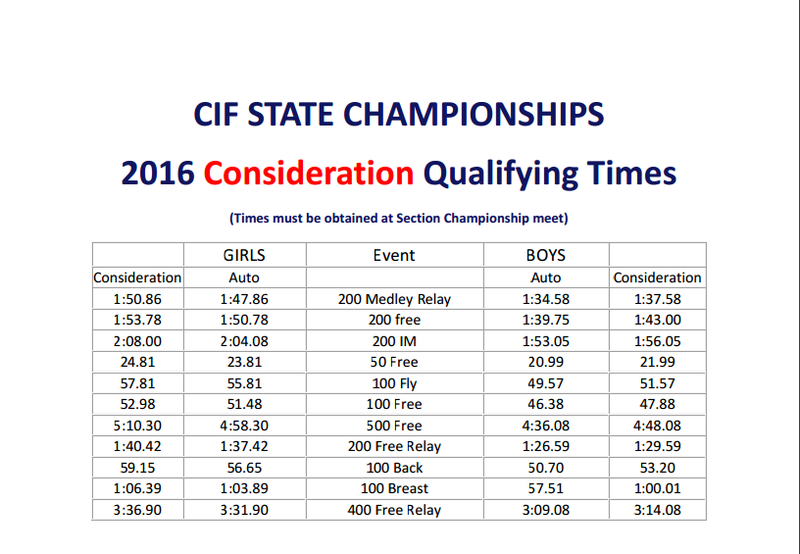 The 2016 CIF State swim meet, which will be held on May 20-21, has added some new time standards and procedures for qualifying. The qualifying procedure now very much resembles that of the CIF Southern Section meet. Each event will take 40 participants. Swimmers that make the at-large time standards will automatically qualify for the event. Swimmers who make the consideration time standards will be eligible to enter the meet. If an event has less than 40 entrants who have met the at-large time standard, it will fill to 40 with swimmers who have consideration times. Last year, the meet used a similar procedure except there were no consideration times. If an athlete or relay team met the at-large time standard, they were eligible to compete in the meet. Anyone who competed in the CIF Southern Section finals was eligible to enter the State meet. Additionally, each section had an allotted number of slots that they would fill in each event. The number of spots a section got depended on the size of the section (most got two-three, the southern section got five). It is unclear whether this system is still in place for the 2016 meet. If it is, it is somewhat irrelevant as the at-large times now serve as automatic qualifying standards. This season, a swimmer or relay team will need to meet the consideration times in order to be eligible to enter the State meet. Another important detail is that for a time to be eligible for entry into the State meet, it must be achieved at the CIF Southern Section championship meet in the finals session. The State meet entries will be a topic of conversation this year, as it is an Olympic year. Even last season, many swimmers who were eligible to compete in the State meet declined to attend in order to start focusing on long course meters training and racing. This seemed especially true for athletes from the Southern Section. Many of the swimmers who were invited from southern California chose to attend the NOVA Grand Challenge, a long course meters meet that was held the same weekend as State in Irvine. All high school meets are held in the short course yards format, while Olympic Trials as well as the Olympics and most major competitions are held in the long course meters format. Additionally, a swimmer must qualify for Olympic Trials in a long course meters swim- there are no short course yards time standards for the Trials. This season, the NOVA Grand Challenge is one week after the State meet. However, with the Olympic Trials just over a month after State, it is fair to speculate that many Olympic Trial qualifiers and hopefuls will choose to not attend the State meet in order to hasten the start of their focus and preparation for long course meters. The “Auto” times are the same as the at-large times. The “consideration times” are the times that must be met in order to enter the State meet. Each event will fill to 40 athletes or relay team. The time must be achieved at the CIF-SS Finals.